NEW YORK (AP) Noah Syndergaard pitched out of trouble in a rusty return from the disabled list and helped himself with an RBI single as the New York Mets beat the Washington Nationals 4-2 on Friday night. Roark (3-12) became the first 12-game loser in the majors this season. He allowed four runs and eight hits in five innings. Matt Adams homered for the inconsistent Nationals, who fell back to .500 at 47-47. They have lost just three of 13 games at Citi Field since the start of last season. After missing seven weeks with a strained ligament in his right index finger, Syndergaard (5-1) came out firing 99 mph fastballs. Robert Gsellman gave up Adams’ upper-deck shot in the eighth but got six outs for his fourth save. BOSTON (AP) – Kevin Pillar had four hits and Justin Smoak had three, including a pair of homers, and they drove in four runs apiece to help Toronto snap Boston’s 10-game winning streak. Rick Porcello (11-4) allowed seven hits and eight runs in two innings to take the loss. LOS ANGELES (AP) – Max Muncy homered and drove in the go-ahead run in the seventh inning, helping the Los Angeles Dodgers rally past the Angels in the resumption of the Freeway Series. The Angels took two out of three last week in Anaheim. Muncy, who will participate in next week’s Home Run Derby, singled to deep right-center off Cam Bedrosian (3-2), scoring pinch-hitter Logan Forsythe and Joc Pederson to put the Dodgers ahead 3-2. Muncy took second on right fielder Kole Calhoun’s throw that sailed over the head of catcher Jose Briceno. Bedrosian scrambled to the backstop, but he bobbled the ball and had no throw to the plate as Pederson scored. Caleb Ferguson (2-1) got the win with two perfect innings of relief. Scott Alexander induced a double play to end the ninth for his first save. MIAMI (AP) – Aaron Altherr drove in his first run of July and later started a sensational relay to protect the lead, helping Jake Arrieta and Philadelphia top the Miami. Arrieta (7-6) pitched seven innings of three-hit ball. 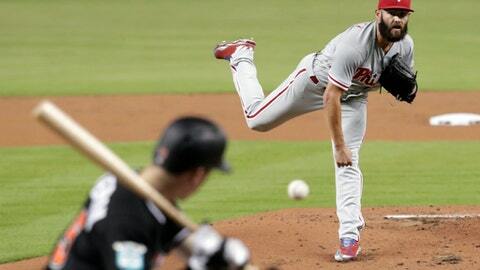 Victor Arano got three outs and Pat Neshek finished the three-hitter for his first save. For Marlins starter Wei-Yin Chen (2-7), it was another brilliant home showing. He allowed one run and five hits in six innings, striking out eight – his most since May 2016 – and walking one. At home this season, his ERA is now 1.83. On the road, it’s 10.47. CLEVELAND (AP) – Rookie right-hander Shane Bieber pitched into the eighth inning and Cleveland’s shaky bullpen narrowly closed things out. Closer Cody Allen, who allowed a career-high six runs in the ninth inning against Cincinnati on Tuesday, gave up Giancarlo Stanton’s leadoff homer but recorded his 19th save in 20 chances. Yankees rookie Domingo German (2-5) allowed six runs – matching a season high – in four-plus innings. SAN DIEGO (AP) – Anthony Rizzo hit a tying double with two outs in the ninth inning and Javier Baez scored the go-ahead run on consecutive errors with one out in the 10th, lifting Chicago over San Diego. PITTSBURGH (AP) – Josh Bell tied a career with four hits, Gregory Polanco homered and both drove in two runs to lead Pittsburgh over Milwaukee. Nick Kingham (4-4) tied a career high with nine strikeouts and allowed three runs over 6 1/3 innings. Kyle Crick got four outs for his second save of the season. Milwaukee starter Junior Guerra (6-6) yielded six runs, nine hits and two walks in four innings. He struck out four. MINNEAPOLIS (AP) – Joe Mauer homered and drove in four runs, Jake Cave had three hits and a pair of RBIs, and Robbie Grossman added three hits for Minnesota, which has won eight of nine games on its homestand. SAN FRANCISCO (AP) – Buster Posey singled in the go-ahead run in the sixth inning and San Francisco slowed down surging Oakland. Madison Bumgarner (3-3) pitched three-hit ball over six innings to win consecutive starts for the first time this season. Alen Hanson added two hits and Steven Duggar had two RBIs and scored twice. Oakland All-Star second baseman Jed Lowrie was forced out of the game with a left leg contusion following a collision with Stephen Piscotty while both chased Hanson’s fly ball to short right field in the third. Lowrie’s status for Tuesday’s All-Star Game in Washington is uncertain. He was selected to the AL team as an injury replacement for Gleyber Torres of the New York Yankees. Neither team did much offensively early and the Giants scored their first run on a balk by A’s starter Edwin Jackson (1-1) in the fourth. The A’s had won 19 of 24 and took three of four from AL West-leading Houston before falling to their rivals from across the San Francisco Bay. ST. LOUIS (AP) – Scooter Gennett and Dilson Herrera homered, Matt Harvey (5-5) tossed five solid innings and Cincinnati beat St. Louis. BALTIMORE (AP) – Ryan Rua had a tiebreaking, pinch-hit three-run homer in the seventh inning and Texas held on to snap a three-game losing streak. Joey Gallo gave the Rangers the lead when he led off the fifth with a home run off Alex Cobb (2-12). DENVER (AP) – Trevor Story homered and drove in four runs, Charlie Blackmon also connected and Tony Wolters had three RBIs for Colorado, which won its third straight. Harrison Musgrave (1-1) pitched three innings to get his first career win. ATLANTA (AP) – Nick Ahmed hit a tiebreaking single in the seventh after Zack Godley allowed a run over six innings and Arizona beat Atlanta. Both teams began the week in first place but have since fallen out. The Diamondbacks began the night a half game behind the Dodgers in the NL West. The Braves fell 1 games behind NL East-leading Philadelphia. Sam Freeman (2-5) took the loss in relief of Atlanta starter Anibal Sanchez. HOUSTON (AP) – Dallas Keuchel pitched six strong innings, three relievers completed the seven-hitter and Alex Bregman provided the offense by setting a career high with his 20th homer to give Houston a win over Detroit. Keuchel (7-8) allowed six hits and struck out four to win his fourth straight decision after dropping the previous three. Tony Sipp and Brad Peacock pitched the seventh and eighth innings before Hector Rondon walked one in the ninth for his eighth save. The Astros got to former teammate Mike Fiers (6-6) early. George Springer hit a leadoff single before the two-run shot by Bregman, which bounced off the wall above the Crawford Boxes in left field, made it 2-0. Ronny Rodriguez had two hits for the Tigers, who went 1 for 9 with runners in scoring position to lose their fifth straight game. CHICAGO (AP) – Leury Garcia had three hits and three RBIs, All-Star Jose Abreu homered for the first time in July and Chicago beat Kansas City. Joakim Soria pitched the ninth for his 14th save in 17 chances. James Shields (4-10) pitched five-hit ball into the seventh inning as the White Sox earned their second straight win after a six-game slide.